It was in 2005 that Tory Burch launched Toryburch.com and then in 2006 that she added shoes for the first time as part of her fall collection. (Retrieved on April 23, 2013 from http://www.vogue.com/voguepedia/Tory_Burch) It was in that year that the Reva flat was born. It has become one of her best-sellers. (Retrieved April 23, 2013 from http://www.businessinsider.com/tory-burch-success-story-2012-9?op=1) But there are more Tory Burch ballet flats than just the Revas. Interestingly enough, the other preferred Tory Burch flat are called, Eddies - a male name, no less. Since I only have one pair of ballet flats, brand name Espace, I am certainly not "qualified" to write this post. In keeping with the Reva/Eddie (female/male), I have asked Brian Davis and Joelle Aidan to help by offering their NICE, NOTE-WORTHY, NO THANKS, NEED and NEW for this post. And so I am pleased to introduce a Calgarian woman and her TB flats to a Calgarian man and his TB flats. Brian Davis Nice: Ask any women what they think of when they hear "Tory Burch flats"? Undoubtedly they will say the Tory Burch Reva. The ones with the big gold or silver medallion on the toe. 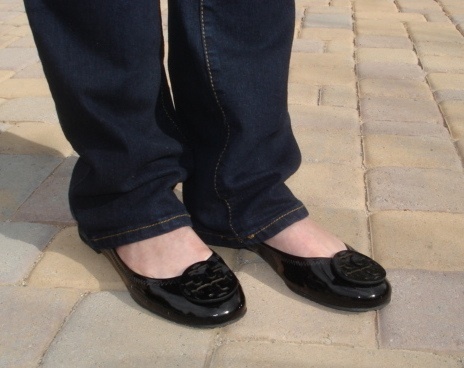 These classic black leather Reva flats with the shiny medallion were "must have" flats for me. I have two pairs of them, one with the gold medallion and one with the silver. I don't think I could pick a favourite between the two pairs. The gold ones were bought in person at the Tory Burch boutique and the silver one were bought at Holt Renfrew. Even with some discomfort and foot pain breaking them in they are my NICE flats. Joelle Aidan Nice: I own 2 pairs of Revas – the classic black leather with a gold “T” emblem and a pair of light purple suede, again with a gold “T” emblem. I first saw the purple suede when on vacation in San Francisco and failed to follow “the rule” of "see it, like it, buy it" because I thought we would be returning to that part of downtown and never did on that trip. As luck would have it, about a month later my husband and I were on a 4 day weekend getaway with another couple in Portland, Oregon and I saw the suede pair at the Nordstrom’s store. I took that as a sign of fate (or shoe gods) intervening and thought it completely prudent to purchase not only the purple suede pair but the black pair as well. My rationale was that the suede pair could be “indoor” shoes (living in western Canada the weather it not always conducive to wearing suede shoes outdoors) and the black pair would be the practical, everyday running around shoes. 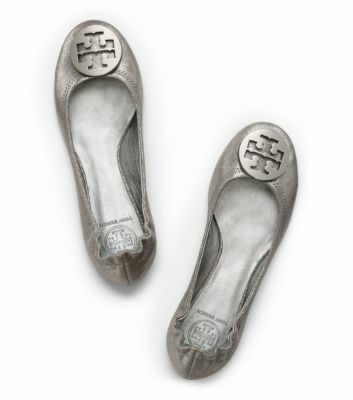 BD No Thanks: It's hard to believe that the very first of Tory Burch flats are my NO THANKS flats. They are black patent and although I love the look of the black patent, they have never moulded to my foot like my other Reva flats; therefore they are not very comfortable. I do still love them since they bring back great memories. This was the first time I ever entered a high end boutique to buy flats for myself and it was a great experience. JA No Thanks: I can't say that I have a NO THANKS. However, as much as I love my Revas, I have to say that they were not the most comfortable the first time I wore them. The “shoe test drive” was when we were hosting a dinner party and I had the ability to change them as the night wore on. The Revas became definitely more comfortable at about the third wearing. 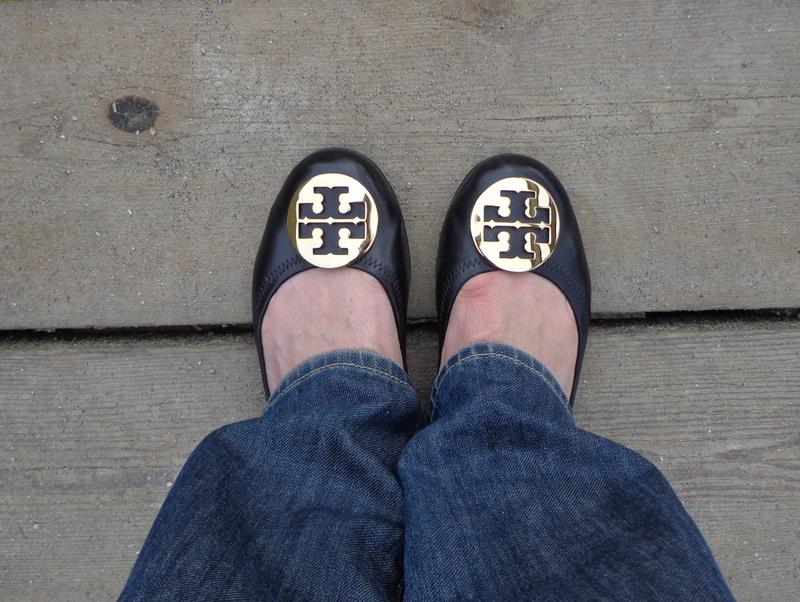 BD Note-Worthy: All of my 14 pairs of Tory Burch flats have some NOTE-WORTHY component to them. I was having a hard time deciding, then I had an idea. I let the public pick - the pair that received the most positive attention and comments on my Flicker account would be my most NOTE-WORTHY pair. I'm pleased to present my violet/purple Tory Burch Eddies. These look like black patent until the right light hits the. Then the deep rich purple patent leather reveals it's magical colour. They were bought at Toryburch.com at half price during the "friends and family" sale. JA Note-Worthy: In terms of the whole ballet flat shoe category, I have to say that I prefer the Tory Burch Eddie ballet flat to the Reva. As well, the absence of a decal does make it somewhat more discreet. BD Need: After buying five pairs of Tory Burch Reva flats I started to branch out and try other Tory Burch styles. The Eddie flats took over as my favourites but my next "must have" pair of Tory flats are the Tory Burch Revas in the colour blue Nile. I've seen these in person and the blue leather is so rich and soft. And of course the gold medallion adds the "pop" look to them. BD New: This is always an exciting category. For me NEW is the result of NEED or impulse buying. Most people will agree that sometimes when you aren't looking for anything in particular you find the best things. You may not NEED it but have to have it - impulse buying. 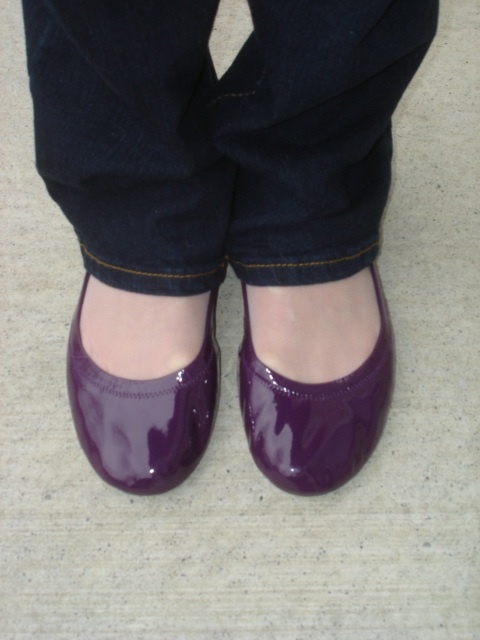 My latest NEW pair of flats came from my NEED list. Last Spring Tory Burch introduced the Water Snakeskin Eddies in a colour called ultramarine blue. A dark navy blue with the water snakeskin pattern. I wanted them but never got them. When I finally decided to get a pair they were sold out. They became my NEED pair of flats. They were so high on my NEED list I even asked my contact sales girl at the Tory Burch boutique in Arizona to watch for a pair for me. I still remember getting her email telling me they had them but in a slightly lighter colour blue called ocean breeze and what size should she put on hold till I could come to Arizona to try them on. Just recently they went from NEED to NEW. These are my new ocean breeze Tory Burch Eddie flats. It doesn't matter how the NEW ones get to you it's just great when they get there. JA New: Unfortunately my newest are not TB flats. I have recently broken the bank and purchased a pair of Lanvin ballet flats and the comfort level has set a new standard. Further, the Lanvin shoes (as simple as they are) are just beautiful to look at. They are the most beautiful shade of pale green - if you can imagine, muted Kelly green. JoyD's "shoe sales" summary: Even though we live in an electronic purchasing world where we can buy anything we want whenever we want and often at discounted prices, we still crave service. Although Brian obviously loves the product, he adores the friendly service from the "amazing" sales associates at the Tory Burch boutiques. As one of the best male Tory Burch customers, Brian concludes that although he really loves the product, it is the sales person who finalizes the sale in the customer's decision-making process. "I love friendly service and I'm sure this is why most guys are afraid to buy flats for themselves. If they received the service I do they wouldn't think twice about buying trying them and buy them in a store." http://closetfashioncontentanalysis.blogspot.ca/2012/05/unintentional-matches.html it was going to turn out like this. I'm so glad I made the comment about Joelle's Tory Burch Eddie flats. I'm sure Joelle never thought when she bought those cute little Eddie flats some guy would comment about them and actually own a pair. Your intriguing answers to me in that post must have spurred some interest for you to do more posts about this new and up coming fashion swing for males. In doing so you have helped many many many males with their feelings and desires to wear women's flats whether it be in private or public. But the person you have helped most is "ME" Thanks you! Thank you for sharing my interest, telling my story and making me feel so good. Each post you have done is amazing and unique but this post is significant since the timeline is over the past year and you added the twist of having your friend Joelle involved as well as me. The acceptance from both of you means so much to us ballet flats wearing males. I always look forward to sharing my new flats with you, working on stories or posts with you and reading the kind comments from others who you have helped. Thank you for your kind comments, Brian. This post created a first for you and for me. You happen to be my first, online friendship that is and I feel like I have known you for a long time, certainly longer than our online correspondences have taken place. And if in some way I have helped make a difference for you and others, well that is a good thing. Yes, in fact . . . who would have thought? After 15 months of blogging, I am now seeing this venue becoming an all-encompassing blog about what women and men are choosing for their closets and the gender-less faction intrigues me the most. I'm not sure how that will develop but we shall see. I think that for me, it is more about not making assumptions about people because of what they are wearing. And perhaps that all started with a young man I once taught who had this Goth/Punk style going on and when he walked down the street, others crossed the street to walk on the other side. Yet, at 16 (no matter his dress) he was kind and caring and very philosophical but that too may lead to another post. You do it every time, Brian . . . you give me ideas for other angles about what people are wearing. I'm loving this "Feature Post" gadget you've added. I love clicking on everyday to see the "post of the day." It also a good chance for me to revisit all your great posts. And I am too! It's a great review for me so that I can re-evaluate favourite or relevant posts. Funny but many people do not comment on old posts because some bloggers disregard them. You could comment on a two year old post and I would respond because it does give me pleasure to realize there are real people out there reading, even the old stuff. After awhile I, the writer, forgets what I have written as well.